Two minutes ago a customer purchased your product online. Like all your other customers this is a person, not a demographic. Strange as it may seem, a demographic has never pulled out a credit card. So, what do you really know about your customers? Knowing your prospective customer is the starting point to creating products or services that people want to buy. It begins at the emotional level by having empathy with them. What are their feelings, thoughts, or attitudes of another? Ideally, it’s putting yourself in their shoes to truly understand them and this can be achieved by creating an empathy map. 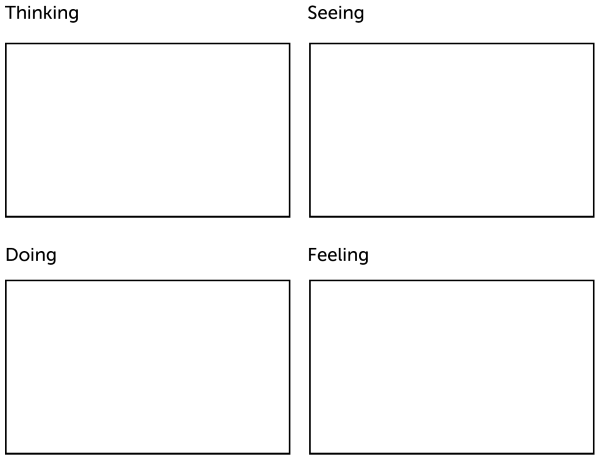 An empathy map represents the sensory information of the customer and is usually shown as four quadrants broken into “Thinking”, “Seeing”, “Doing”, and “Feeling”. This is not about creating a buyer persona or persona – that comes later. Instead, it’s working out who your ideal audience is to buy from you. Although they may appear the same, an empathy map is different from a persona. A buyer persona or avatar, is a portrait of a person, one or more, who are your ideal buyers. They exhibit similar behavioral patterns in their purchasing decisions, lifestyle choices, attitudes, and motivations regardless of age, gender, education, and other typical demographics. Can you see the difference? An empathy map provides emotional information and a buyer persona shows the behavioral patterns of a prospective customer. Empathy is understanding the emotions, feelings and thoughts of another person from their perspective. It’s putting yourself in their shoes. Their perspective is very important because it’s their worldview and how they see the world, not yours. By being able to emphasize with your prospective customer you’ll understand them. When you understand them, you can create products and services that they’ll want to buy. An empathy map creates a composite person and although fictional, will be the best guestimate based on your research. You now need to fill in the quadrants to create a realistic and relevant person that will be the customer that you will most likely attract. What are their behavior characteristics? What are their communication channels? Are there other motivational hurdles? I know this may seem like a lot of work, but it’s research that’s needed to understand your customer. In the long run, it will be invaluable and you’ll be able to redefine your customer over time. Here are some ways you can capture the information required to fill out the empathy map. Social Media observation of groups or communities that represent your ideal audience. Be the market – be a member of the group you’ll sell to. It’s a long game getting a prospective customer to do business with you and it begins at the research phase. For starters, you literally want to be in their shoes. You need to be able to empathize with them and the best way to do that is with an empathy map. 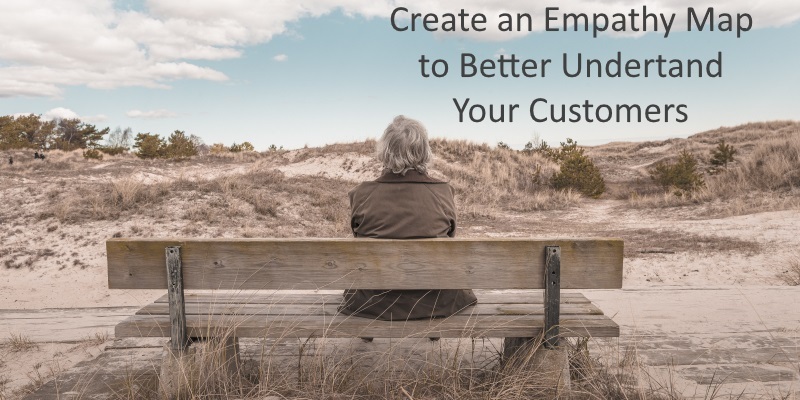 Creating an empathy map provides the emotional information you’ll need to understand your prospective customer in the context of their worldview. In the next article I’ll explore the worldview, which is the why behind behavioral patterns developed with the empathy map. Hi Mark. I got here from your post on LinkedIN, as suggested by Chafia Quasli. This is an interesting concept, and I think bears considering. It looks like you create this map “pre sales” and preferably “pre product creation”. Do you ever create it after the product has been created? You mention gathering the information in a survey. Do you have examples of that? Empathy mapping is best done prior to the “creation” phase. The concept is knowing and understanding your prospective customer in order to create products and services they’ll want to buy from you. Being able to empathize with prospects is to have an understanding of their behavior. The “why” behind their behavior is their worldview. I place less importance on surveys and more on social media and online community observation. You tend to get a better unscripted understanding of the prospect than a survey. Face to face is my second preference. Finally, if you’ve already created a product and have existing customers, you’re in a good position to create an empathy map which would help you modify (fine-tune) your product or service. Thanks for stopping by, Stan! Thank you very much!! I just found your blog. I’m learning a lot with the articles. It wondered if he had to do before the map of empathetic person or the buyer. I slowly it is becoming much clearer. First the map of empathy and then the buyer. What confuses me a bit, is that the information meeting on the buyer person, also tells me I have to do interviews and Accounts. If I do them with the map of ampatia also I have to repeat the buyer person? You have a new follower on the blog. An important starting point is being able to empathize with your buyer. What that really means is understanding their feelings, emotions and behavior. Being able to empathize with your prospective buyer is like putting yourself in their shoes to understand their behavior. There are a number of ways to understand your potential buyers and what makes them tick. One way is by being a member of the market you’ll sell to. Other ways are face to face meeting with people; observing groups and communities on social media; or conducting surveys. Empathy mapping gets you started and over time, you’ll know and understand the group you’re selling to very well.